Global Strays, a 501(c)3 charity founded by young New Yorkers Elizabeth Shafiroff and Lindsey Spielfogel, which focuses on improving the lives of dogs and cats in developing nations held its inaugural fundraiser June 21, 2017 at the Rumpus Room in New York City. Young professionals with a passion for doing good came together to support this worthy cause. Among the event’s approximate 150 attendees were Global Strays founders Elizabeth Shafiroff and Lindsey Spielfogel, Rita Cosby (Emcee), Tomaczek Bednareck, Craig Dix, Lucia Hwong Gordon, Michele Herbert, Carl and Valerie Kempner, Rory Lipman, Dimitra Molossi, Maggie Norris, Sammie Jack Pressman, Victor de Souza, Betsy Spielfogal, Ike Ude, Martin & Jean Shafiroff. The grants aim to help existing organizations develop and expand their spay and neuter programs. Since establishing Global Strays, Ms. Shafiroff and Ms. Spielfogel have made several privately funded trips to Nicaragua, the second poorest country in the Western Hemisphere after Haiti. They strongly believe in the importance of visiting animal welfare organizations to see the work they do first-hand. This means they can vouch for organizations before awarding them grants to be used for food, medications, and spay and neutering efforts. These trips also have allowed the Global Strays founders to bring select dogs to adoptive families in the United States as a symbolic gesture of good will. Though Global Strays currently concentrates on Nicaragua, the organization aims to gradually branch out to other countries as the charity grows. These include the Dominican Republic, Costa Rica, and Saint Lucia. In the long-term, the Global Strays founders hope to change the culture of animal adoption and pet care in developing countries. They want spaying and neutering programs, knowledgeable veterinary care, and compassionate “pet parenting” to become the norm. The grants they award to organizations in developing nations can help turn these dreams into a reality and eventually improve the lives of animals around the world. Proceeds from the fundraiser will go to partner organizations in Central America, as well as Social Tees Animal Rescue Foundation, an organization that rescues animals from high kill shelters across the United States. 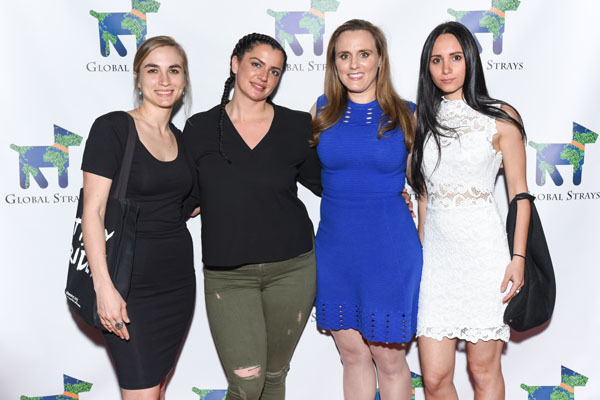 Guests at the fundraiser had the opportunity both to meet the Global Strays founders and also experience a short documentary about the organization’s work in Central America.